Sharififar, F., Khazaeli, P., Alli, N. (2009). In Vivo Evaluation of Anti-inflammatory Activity of Topical Preparations from Fenugreek (Trigonella foenum-graecum L.) Seeds in a Cream Base. Iranian Journal of Pharmaceutical Sciences, 5(3), 157-162. Fariba Sharififar; Payam Khazaeli; Narguess Alli. "In Vivo Evaluation of Anti-inflammatory Activity of Topical Preparations from Fenugreek (Trigonella foenum-graecum L.) Seeds in a Cream Base". 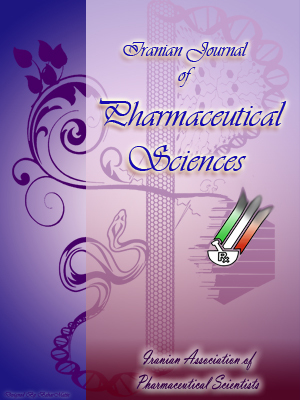 Iranian Journal of Pharmaceutical Sciences, 5, 3, 2009, 157-162. Sharififar, F., Khazaeli, P., Alli, N. (2009). 'In Vivo Evaluation of Anti-inflammatory Activity of Topical Preparations from Fenugreek (Trigonella foenum-graecum L.) Seeds in a Cream Base', Iranian Journal of Pharmaceutical Sciences, 5(3), pp. 157-162. Sharififar, F., Khazaeli, P., Alli, N. In Vivo Evaluation of Anti-inflammatory Activity of Topical Preparations from Fenugreek (Trigonella foenum-graecum L.) Seeds in a Cream Base. Iranian Journal of Pharmaceutical Sciences, 2009; 5(3): 157-162. Fenugreek (Trigonella foeum-graecum L.) has been used in Iranian traditional medicine for treatment of different kinds of inflammation disorders. In the present study, anti- inflammatory activity of the methanolic extract of the plant (at doses of 100, 200 and 400 mg/kg) were studied using carrageenan-induced edema method and compared with the effects of dexamethasone and ibuprofen. Various concentrations of the plant extract (2-5%) were also prepared as a cream and their anti-inflammatory effects were evaluated and compared with 1% hydrocortisone ointment as the reference drug. The results showed that the inhibition of edema by the plant extract at doses of 100 and 200 mg/kg were significantly different from the control group. This activity of the plant at doses of 100 and 200 was not significantly different from those of ibuprofen and dexamethasone. Among the prepared formulations of the plant, 3 and 5% creams of the fenugreek showed the most inhibition of edema which were not significant from hydrocortisone ointment. The results of the present study, therefore, support the traditional uses of this plant for inflammations. However, more research is needed for its use in clinical studies. The available anti-inflammatory drugs (steroidal and non-steroidal) present a wide range of side effects. Therefore, many studies are being directed to find anti-inflammatory agents from natural sources. Fenugreek (Trigonella foenum-graecum; Fabaceae) is a plant whose seeds and leaves are used in traditional medicine. Fenugreek is known to have several pharmacological effects such as: hypoglycemic , hypocholestrolemic , antioxidant , and appetite stimulation . Furthermore, this plant has gastroprotective activity  and histopathological examination of liver and brain has revealed that, aqueous extract of fenugreek seeds offer a significant protection against ethanol toxicity . This plant under the name of "Shanbalileh" in Iranian traditional medicine has been used as hypoglycemic and antirheumatism . In the present study, anti-inflammatory effect of this plant is evaluated. Carrageenan (type I; Sigma Chemical Co., St. Louis, MO, U.S.A.); ibuprofen (Hakim Pharmaceutical Co. Ltd., Iran); dexamethasone ampule (Sina-Daru Pharmaceutical Co. Ltd., Iran); carboxymethyl cellulose-sodium (CMC-Na Iran); and hydrocortisone ointment (1%, Abooreihan Pharmaceutical Co., Ltd, Iran) were used in the present study. The dried seeds of the fenugreek (500 g) was prepared from the local market and after authorization by a botanist were extracted with methanol using percolation method. The resultant extract was dried under vacuum to give a viscose mass. The extract was suspended in 0.1% DMSO/normal saline (v/v) with CMC 1% for the in vivo tests. Figure 1. DFR: Differences of volume of right foot paw before and 4 h and after injection of normal saline. DFL: Differences of volume of left foot paw before and 4 h and after injection of carrageenan. (a): Dose 100 mg/kg, (b) Dose of 200 mg/kg, (c) Dose of 400 mg/kg of the plant extract. Table 1.Effect of topical administration of different preparations of fenugreek creams on carrageenan-induced paw edema in rats. n: Number of animals. a0.3 g of preparation were applied to the plantar surface of the right hind paw by gently rubbing 50 times with the index finger. bValues are mean±SEM. *p < 0.05. **p < 0.01. Formulation of fenugreek creams was done as following procedure: At first, stearic acid (15 g) and cetylalcohol were mixed, blended and warmed to melt to to 70 °C. Isopropylmyristate (3 g) was added and dispersed by mixing. The extract was warmed and gradually was added to glycerin (6 g) with continuous levigate. The mixture was added to water (74.7 g) with methyl paraben (0.15 g) as preservative and heated to 70 °C. This phase was added to oily phase and mixed with a blender for approximately 20 min. (300 rev/min.). The mixture was neutralized using KOH (0.5 g) and NaOH (0.15 g). Male rats weighing 250-300 g were employed for anti-inflammatory tests. The animals were obtained from the Neuroscience Research Center, Kerman University of Medical Sciences. They were housed in the room temperature 22±2 °C at 12-h light:12-h dark cycle. They had free access to food and water except during the time of experiments. Groups each with 6 animals were used. This study complied with current ethical regulations on animal research (National Research Council of USA, 1996) and related rules of our school and all animals used in the experiment received humane care. The inhibitory effect of fenugreek on carrageenan-induced edema was evaluated using method of Yesilada  with some modifications. Briefly, edema was induced by injecting 0.1 ml of 0.5% carrageenan subcutaneously into the sub-plantar region of the left hind paw of Wistar rats. Equal volume of solvent (normal saline) was injected into right hind paw. Various doses of the extract (100, 200 and 400 mg/kg) was administered i.p. to left hind paw. The reference group received ibuprofen (400 mg/kg, i.p.) and the control group received an equal volume of solvent. All drugs were administrated just after injection of carrageenan (T=0). The volume of both hind paw was measured with a plethysmometer at 0 h (just after carrageenan injection), 1, 2, 3 and 4 h. Differences of volume of two paw were considered as carrageenan-induced edema. For evaluating of antiinflammatory activity of topical preparations of fenugreek, 0.3 g of cream containing 2, 3 and 5% of the methanolic extract of the plant were applied to the plantar surface of the left hind paw by gently rubbing 50 times with the index finger. Rats of the control groups received only the cream base. Hydrocortisone ointment (1%) was used as the reference drug . Results are expressed as mean±SEM. The data from experiments were analysed separately using oneway ANOVA option in the SPSS: 11.5 software. The differences between means were compared using Tukey's honest significant test. Figure 1 shows the mean differences of volume of right and left foot paw before and 4 h after i.p. administration of normal saline and carrageenan, respectively. As shown in this figure the index of carrageenan-induced edema is completely different from the ones for normal saline. Methanolic extract of fenugreek seeds at the doses of 100 and 200 mg/kg has shown the most anti-inflammatory activity 1, 2 and 4 h after carrageenan administration. As shown in Figure 2, these extracts notably inhibited paw edema in rat when given i.p. at 3 h and 4 h after carrageenan injection. The results of anti-inflammatory activity after topical administration of fenugreek are reported in Table 1. Statistical analysis showed that the edema inhibitions of preparations of fenugreek creams are significantly different from the control group. Significant differences between the 1% hydrocortisone ointment (positive control) and the formulations of 3 and 5% fenugreek cream are not observed (p>0.05). Carrageenan-induced paw edema in mice has been accepted as a useful phlogistic tool for investigating anti-inflammatory agents. It is suggested that there are biphasic effects in carrageenan-induced edema. The early hyperemia results from the release of histamine and serotonin, the delayed phase of carrageenan-induced edema results mainly from the potentiating effects of bradykinin on mediator release, and also from prostaglandins which produce edema after the mobilization of leukocytes . The edema was reached its highest thickness 4 h after the application of the stimulus. The present work showed that T. foenum-graecum at the doses of 100 and 200 mg/kg significantly reduced the paw oedema throughout the entire period of observation in comparison to control (p < 0.05). This activity showed no significant difference in comparison to ibuprofen, thus suggesting an anti-inflammatory activity for this plant (Figure 2). Presence of saponins and flavonoids as the major compounds in T. foenum-graecum [11, 12] can approximately explain anti-inflammatory activity of the plant. From these overall results, we can conclude that the topical preparations containing 3% and 5% of fenugreek seeds extract possess an anti-inflammatory effect. The seeds of T. foenum-graecum contain flavonoids , alkaloids  and salicylate . Flavonoids act as potential inhibitors of cyclooxygenase, lipoxygenase, and nitric oxide synthase as well as being antioxidants [15, 16]. Antipyretic and anti-inflammatory activity of the leaves of T. foenum-graecum has been reported . The results here support the traditional uses of the seeds of T. foenum-graecum for treatment of inflammations. However, it is needed to do more toxicological research for clinical studies. Furthermore regarding the presence of different secondary metabolites in this plant, separation and identification of biological compounds of the plant is valuable for finding new agents with anti inflammatory activity. It has been reported that the fenugreek seeds exert antiulcer activity through the flavonoids since flavonoids are reported to protect the mucosa by preventing the formation of lesions by various necrotic agents .The latter experiments are running. Figure 2. The DFL-DFR show the carrageenan-induced edema in the left foot paw (a): Dose 100mg/kg, (b) Dose of 200mg/kg, (c) Dose of 400mg/kg of the plant extract. T. foenum graecum seeds at the dose of 100 and 200mg/kg have shown the most anti- inflammatory activity at 1, 2 and 4h after carrageenan administration. Results are expressed as mean ± S.E.M. Differences between the control and treated groups were tested for significance using a one-way analysis of variance (ANOVA). * Significant differences with Ibuprofen group (p < 0.05). This research was supported by the foundation (No. 85/2) from the Research center of Neurosciece, Kerman University of Medical Sciences, Iran. The authors are also grateful to Dr. Mirtajaldini, Botany Department, Bahonar University,kerman, for assisting in the identification and collection of plant materials. Sharma RD, Raghuram TC, Rao NS. Effects of fenugreek seeds on blood glucose and serum lipid in type I diabetes. Eur J clin nutr 1990; 44: 301-6. Ajabnoor MA, Tilmisany AK. Effect of Trigonella foenum-graecum on blood glucose levels in normal and alloxan-diabetic mice. J Ethnopharmacol 1998; 22: 45-9. El-Sokkary AM, Ghoneim MA. Effect of plants antioxidants in retarding the oxidative deterioration of Samna [Ghee]. Indian J Dairy Sci 1951; 4: 123-8. Bouaziz A. Veterinary drugs. French Demande 1976; 20: 4-8. Pandian RS, Anuradha CV, Viswanathan P. Gas-troprotective effect of fenugreek seeds (Trigonella foenum graecum) on experimental gastric ulcer in rats. J Ethnopharmacol 2002; 81: 393-7. Thirunavukkarasu V, Anuradha CV, Viswanathan P. Protective effect of fenugreek (Trigonella foenum graecum) seeds in experimental ethanol toxicity. Phytother Res 2003; 17: 737-43. Zargari A. Medicinal plants. Vol 1 and 3. Tehran: Tehran University Press, 1996; pp. 637, 927, 362. Yesilada E, Küpeli E. Berberis crataegina DC. root exhibits potent anti-inflammatory, analgesic and febrifuge effects in mice and rats. J Ethnopharmacol 2002; 79: 237-48. Calvo MI. Anti-inflammatory and analgesic activity of the topical preparation of Verbena officinalis L. J Ethnopharmacol 2006; 107: 380-2. Garcia-Pastor P, Randazzo A, Gomez-Paloma L, Alcaraz MJ, Paya M. Effects of petrosaspongi-olide M, a novel phospholipase A2 inhibitor, on acute and chronic inflammation. J Pharmacol Exp Ther 1999; 289: 166-72. Shang M, Cai S, Han J, Li J, Zhao Y, Zheng J, Namba T, Kadota S, Tezuka Y, Fan W. Studies on flavonoids from Fenugreek (Trigonella foenum graecum). Zhongguo Zhong Yao Za Zhi 1998;23: 614-6. Raju J, Patlolla JMR, Swamy MV, Rao CV. Diosgenin, a steroid saponin of Trigonella foenum graecum (Fenugreek), inhibits azoxymethane-induced aberrant crypt foci formation in F344 rats and induces apoptosis in HT-29 human colon cancer cells. Cancer Epidemiol Biomarkers Prev 2004; 13: 1392-8. Jain SC, Madhu A. Regulation of trigonellin in Trigonella species by chemical mutagenic treatments. Indian Drugs 1988; 26: 14-6. Swain AR, Dutton SP, Truswell AS. Salicylates in foods. J Am Diet Assoc 1985; 85; 950-60. Rao YK, Fang SH, Tzeng YM. Anti-inflammatory activities of flavonoids isolated from Caesalpinia pulcherrima. J Ethnopharmacol 2005; 100: 249-53. Sharififar F, Dehghan-Nudeh GH, Mirtajaldini M. Major flavonoids with antioxidant activity from Teucrium polium L. Food Chem 2009; 114: 885-8. Ahmadiani A, Javan M, Semnanian S, Barat E, Kamalinejad M. Anti-inflammatory and antipyretic effects of Trigonella foenum-graecum leaves extract in rat. J Ethnopharmacol 2001; 75:125-9. Suja Pandian R, Anuradha CV, Viswanathan P. Gastroprotective effect of fenugreek seeds (Trigonella foenum-graecum) on experimental gastric ulcer in rats. J Ethnopharmacol 2002; 81: 393-7.